* There are no longer connectors fitted for the Commodore 128/128D, but those can be added if necessary (soldering required). 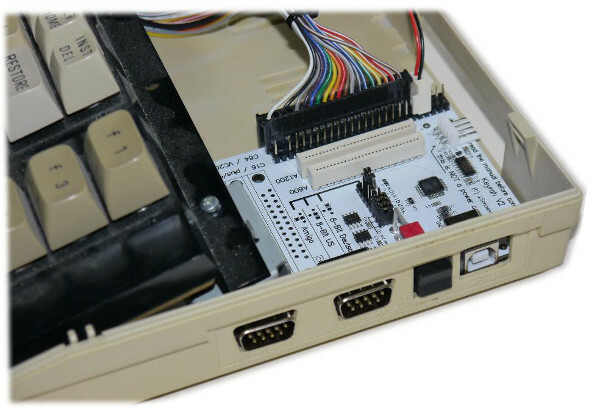 You can use the configuration options to add a C128D connector (already soldered to the PCB). 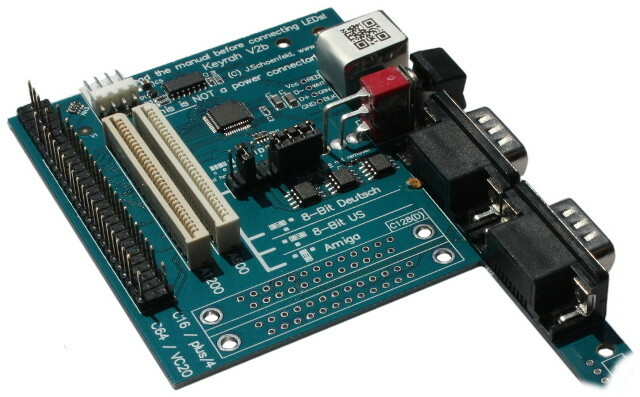 ** There are also no connectors for the Plus/4 and C-116, those can also be fitted (PCB modification and soldering required). Unlike the old Keyrah interface that required you to choose between the different supported computer families, Keyrah V2 comes in a single version that works with all systems. It also supports both German and English keyboard layouts, so this distinction is also history. Keyrah V2 provides a jumper that lets you choose the desired configuration, you can either set it to 8-Bit with German keymap, 8-Bit with US keymap, or Amiga. 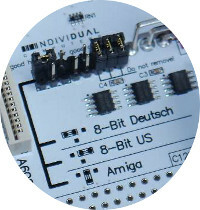 ***An internal USB connector is not present but can be fitted, which also requires soldering. Please note that Keyrah is a pure USB device, it will not work with USB-to-PS/2 adapters. USB lead NOT included, please add one via the configuration options.